BPAS announced today that it is honoring Eugene Maloney, Esquire. In recognition of Maloney’s accomplishments, BPAS is dedicating the conference and training room in its Pittsburgh office. The Eugene Maloney Training and Conference Center will feature a special plaque and tribute in Maloney’s honor. As corporate counsel and Executive Vice President at Federated Investors since 1972, Maloney has been the leading authority on all matters of fiduciary prudence. He has been instrumental in helping partners and Trustees establish sound processes for managing assets and client relationships. BPAS would like to thank Gene for the key role he played in working with our company in matters of trustee delegation and processes in a retirement plan setting,” said Paul Neveu, President of BPAS Plan Administration & Recordkeeping. “Going back 20 years ago, he helped us create a new focus on working with corporate fiduciaries, which became a major line of business for our firm. Throughout his career, Maloney has worked closely as an advisor to corporate trustees on all matters of fiduciary prudence helping them to establish sound processes for managing assets and client relationships. He was instrumental in legislation that permits public entities to use money-market funds to manage liquidity. He has also served as a Trust and Securities Law Instructor at Boston University over the years. 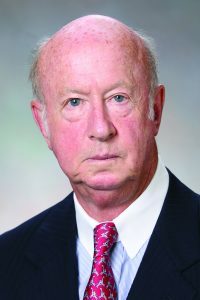 In addition, Maloney has served as an expert witness in judicial and legislative settings on matters relating to fiduciary compensation, will construction, and prudent investing. He is a current member of the Advisory Board for the David Berg Center for Leadership and Ethics at the Katz Graduate School of Business, University of Pittsburgh. A well-respected author, Maloney’s articles have been featured in countless financial and legal publications. He has also issued educational videos and memoranda on the Uniform Prudent Investor Act, the Gramm Leach Bliley Act, asset allocation, retirement plan fee disclosure and compliance, fiduciary compensation, and a host of other topics. The BPAS Eugene Maloney Training and Conference Center will be officially dedicated on February 15, 2019. BPAS is also donating to the American Cancer Society, an organization that is special to Maloney, in recognition of his contributions to the industry. “We also send warm regards to friends and colleagues at Federated Investors who have been part of the ‘Maloney experience’ over the years,” added Neveu.